​St. 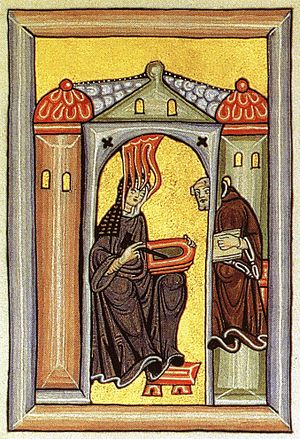 Hildegard von Bingen, 1098-1179, Daughter of Mechtild of Merxheim-Nahet and Hildebert of Bermersheim, a mystic nun who was one of the greatest figures and perhaps the most prolific writer of the Middle Ages, a leading intellectual and mystic of the twelfth century. Her first visionary work "Know The Ways of the Lord" was followed by a profusion of literary works including the earliest known liturgical-morality play. She is often called the marvel of Germany writing about the curative powers of various natural objects. Her work “Physica” comprised of nine books with two hundred and thirty chapters includes classification of the various natural elements in the world such as plants, animals, birds and fish, in addition to precious stones and metals. Hildegard’s book Causae et Curae with three hundred chapters has an interesting segment in which she insists that the world should be grateful it was Eve that succumbed to the lures of the serpent because original sin initiated by man would have been so strong and incorrigible that he would neither wish nor able to be saved. Hildegard was a prolific letter writer, numbering three hundred ninety and include correspondence with popes, bishops, kings, queens, laymen and woman attacking corruption, suggests reforms, moral support and gives administrative and personal advice. She had a remarkable sense of the synergy of the Earth, now known as thermodynamics, and differed from the average person in her belief that the Earth was a sphere and her ideas on universal gravitation were correct and pre-date Newton's by several centuries. 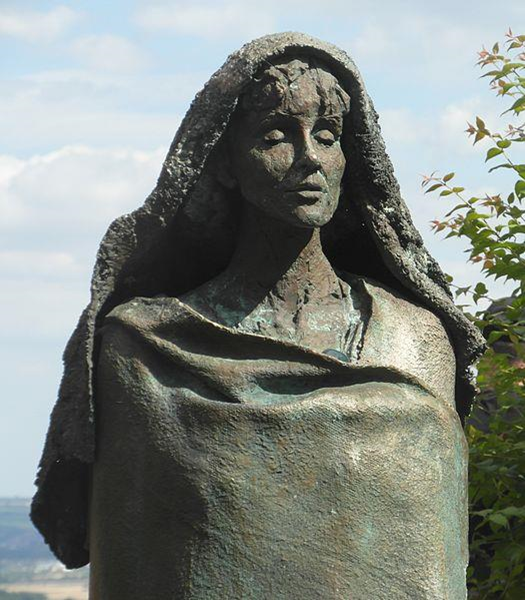 Bronze Sculpture of Hildegarde von Bingen in front of the Benedictine Abbey of Eibingen, sculptor Karlheinz Oswald 1958 CE © Gerda Arendt. CC BY-SA 3.0.